In geometry, an angle can be defined as the figure formed by two rays meeting at a common end point. An angle is represented by the symbol ∠. Here, the angle below is ∠AOB. Angles are measured in degrees, using a protractor. Arms: The two rays joining to form an angle are called arms of an angle. Here, OA and OB are the arms of the ∠AOB. Vertex: The common end point at which the two rays meet to form an angle is called the vertex. Here, the point O is the vertex of ∠AOB. We can find angles in various things around us, such as in a pair of scissors, a hockey stick, a chair. 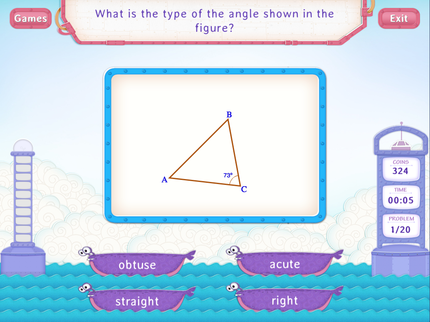 Interior angles: Interior Angles are the angles formed within or inside a shape. Here, ∠ABC, ∠BCA and ∠CAB are interior angles. Exterior angles: Exterior angles are the angles formed outside between any side of a shape, and a line extended from the adjoining side. Here, ∠ACD is an exterior angle. 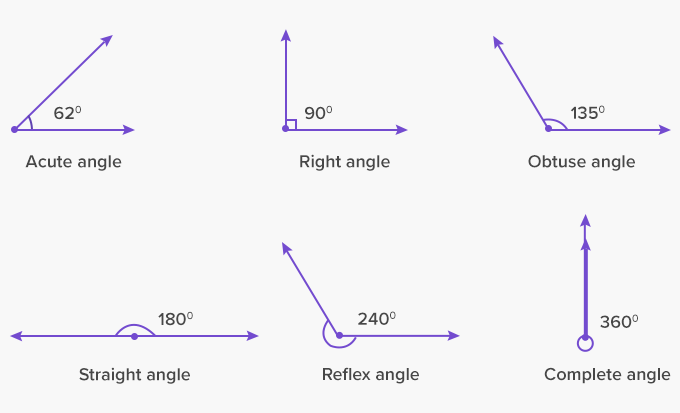 The word ‘angle’ has been derived from the Latin word Angulus, meaning “a little bending”. The concept of angle was first used by Eudemus, who defined an angle as a deviation from a straight line. Straight angle in a straw in soda-lime! So many angles all around, even in a mime! Instead of handing out geometry angles worksheets to your children, ask your child to observe/spot the things in which they can find different angles such as in a hanger, hands of a clock, or the roof a house.